Community members are invited to a public meeting for a presentation and discussion concerning a new Municipal Plan and Development Regulations for the Town of Roddickton – Bide Arm, for 2017-2027. The Planning Area includes the entire Town of Roddickton – Bide Arm plus that part of the East Brook Pond Protected Public Water Supply Area lying outside the Town boundary. The First Clay Cove Pond Protected Public Water Supply Area is inside the Town boundary and thus is included. The work carried out in 2010 for the Town’s Integrated Community Sustainability Plan (ICSP) identified the need to update these documents. The documents for Roddickton pre-dated the amalgamation with Bide Arm and needed review in any event, and the former Town of Bide Arm did not have a Municipal Plan and Development Regulations and thus will be included in those now being proposed for the Planning Area. The Town has retained a planning consultant who has carried out research on the opportunities and circumstances affecting development of the Town, and has prepared drafts of the new Municipal Plan and Development Regulations. 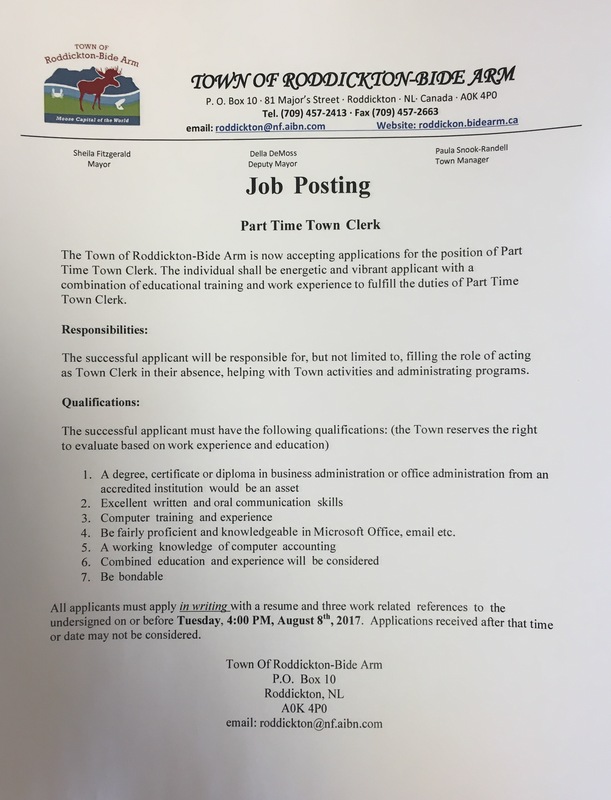 These documents are available at the Town office for viewing and are posted on the Town Website (roddickton.bidearm.ca) under the blog section. They can also be sent by email as pdfs. The email address to request a pdf copy is townclerk@bellaliant.com. Please review these documents and come with your questions and suggestions. This is a reminder that Monday, August 7th is Roddickton-Bide Arm Day for 2017. This is a civic holiday which has been declared by Council under the Provincial Shop Closing Act and as such all businesses, unless they are exempted under the Act, are required to be closed on that day.